Perhaps, like many writers, you’ve made a commitment to go public by posting your words on a blog. Some people subscribe, click Like or leave comments. But you’re not exactly burning up the internet with traffic. Well, Andreea Ayers over at Launch Grow Joy has some suggestions for you. Have a look at her chart, 30 Ways to Promote Your Blog Posts. If you’re selling products, Andreea has lots of marketing suggestions for those, too, so browse around. You can also find Launch Grow Joy on Facebook. The 8- and 9-year-olds started by studying the Taylor River, which runs through the town of Blenheim, at the north end of New Zealand’s South Island. The water was not as pristine as the students expected. They did some cleanup and installed hundreds of blue plastic fish at storm drains, warning visitors of the hazards of polluting the river. Then they wrote up their findings, including poems. A local organization, Go M.A.D. 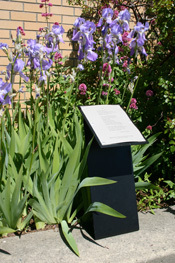 (Making A Difference) helped to establish a poetry walk along the river, and in 2010 the first student poem was engraved on a granite plaque that was secured to a large boulder, inaugurating the Taylor River Poetry Walk. They later won a prize for their accomplishments. Although it was initially seen as a one-time project, the challenge has passed from school to school and each year a new group of students adds a poem to the walk. In 2012, students from Mayfield School added the third poem-boulder in the celebration shown above. See other posts tagged poetry walk or scroll down the right sidebar to the Poetry Walk section for links. Six days, four venues, seven stages, dances, films, panel discussions, a whole herd of workshops and more than 50 poets, musicians and musical groups from the U.S. and Canada (and butteri, cowboys from the Maremma area of southern Tuscany). That’s the 29th National Cowboy Poetry Gathering, which begins today in Elko, Nevada. Many performances will be added to the Western Folklife Center‘s National Cowboy Poetry Gathering YouTube channel. Click here for all the details and don’t miss the lineup of performers, audio files and very fine cowboy hats. Yee-haw! Perhaps you’ve noticed that little “libraries” are cropping up all over the place. Old phone booths, newspaper boxes, mailboxes and other serviceable containers have been cleaned up, painted up, set up and stocked with books that passersby are welcome to borrow and replace. Well, here’s another one, in Berlin. 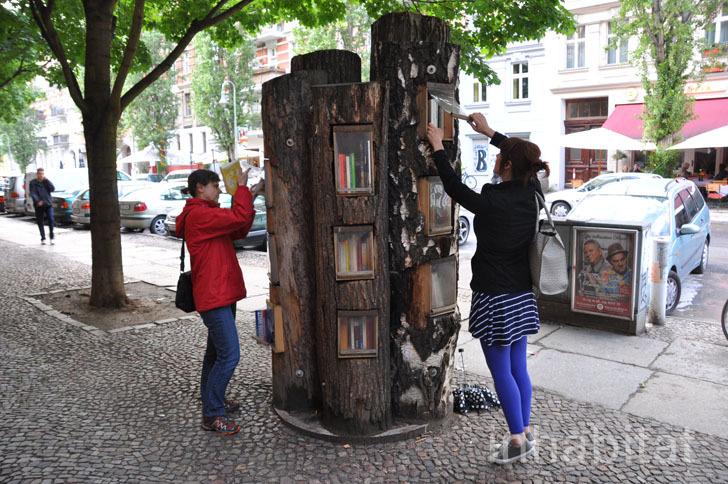 Created by Baufachfrau Berlin and known as Forest Books, this sidewalk library is constructed of bolted-together tree trunks, each inset with several protected book-holding niches. Read the story and see more photos on Inhabitat. Read more about the international book-distribution movement spurred on by the folks at Little Free Library. Now, Micah Walter in the Cooper-Hewitt Labs has posted a random assortment of these un-imaged objects to a tumblr site, Curatorial Poetry. What you see is the object catalog number and its description. You get to imagine everything else…and, if you’d like, submit it, though there’s no knowing where submissions go or whether they will be displayed. You can also visit Curatorial Poetry on Facebook and find out more about the tech behind the tumblr (and Micah Walter) here. And if Curatorial Poetry doesn’t ring your chimes, have a look at the Cooper-Hewitt’s Object of the Day, which just might propel your imagination in new directions.